SKU: 14-KF0019.1. Categories: Designer Kaftans, Featured product. Tags: buy cheap kaftans online, Buy Designer Kaftans Online Australia, buy kaaftans online, kaftan online, kaftans australia. Feel like a jewel in the summer sun with this gorgeous embellished kaftan from Pretty-Porter. The ‘Bejewelled’ kaftan shines brighter than any diamond with its vibrant colours and decorative pattern. The bright blues and yellow of this beautiful garment create a look that’s fun and modern, yet elegant and classy. Designed to fit women of all shapes and sizes, the ‘Bejewelled’ kaftan is comfortable and loose-fitting. 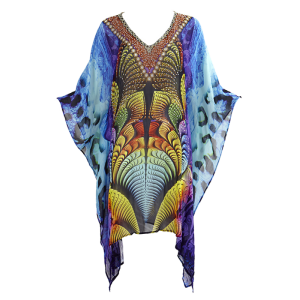 Whether you’re heading to the beach or out to dinner, this embellished kaftan can keep you cool. The breezy viscose fabric breathes well in warm climates,while regulating body temperature. When you purchase a kaftan from Pretty-Porter you can be sure that all eyes will be on you. We offer fabulous designs and attention-grabbing colours that will make you the envy of all your friends.